(1) Accreditation being sought from Council of British International Schools (COBIS); British Schools Middle East (BSME); and British School Overseas (BSO). •	Extremely high levels of investment and thoughtfulness in design and breadth of facilities - stand-out auditorium and investment in the Arts. •	One of the most impressive new school launches of 2017 which over the course of 2018 has gone from strength to strength. An exceptionally impressive school in phased launch. The future looks bright. 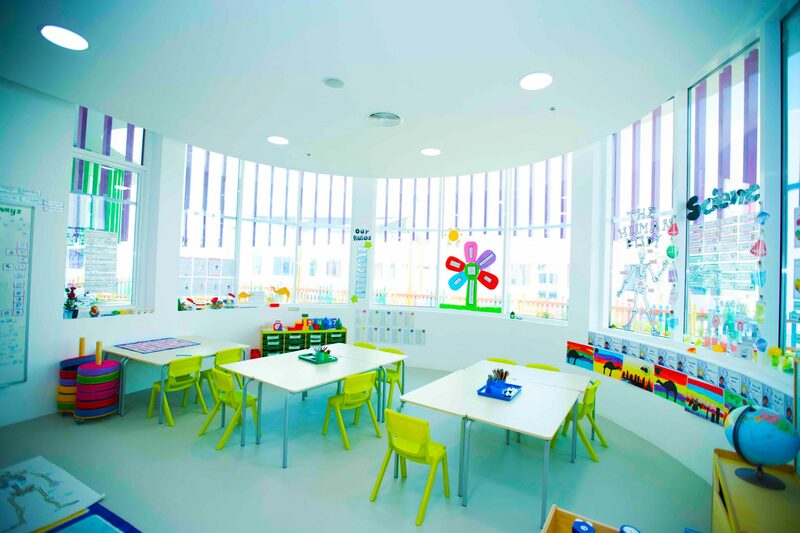 Dubai Heights Academy (DHA) is a new British curriculum AED159M school which opened on a 2,800,000 Square foot site in Al Barsha in September 2017. Dubai Heights Academy is in phased launch to provide a full British Early Years Foundation Stage to Year 11 IGCSE. It is likely that this will be followed by a choice between the International Baccalaureate, A level and BTEC at Sixth Form although, understandably, final details on the breadth of provision are still under strategic review. As pointed out to us, by the time Sixth Form at Dubai Heights is embedded, we may well see a very different British school environment with T levels sharing equal place to traditional A Levels. The Secondary School will open in September 2020 for Years 7 – 11 with IGCSE’s being sat for the first time in 2023. We really like this choice to phase the school’s opening so slowly. It allows the school to grow organically as each year works its way through the school. This approach generally avoids many of the teething problems that often come with attempts to open all-through provision from a school’s launch. It also allows a much greater opportunity for founding parents and children to guide the ethos and development of school’s culture. Our 2018 visit (October) revealed an extremely happy school environment with some of the highest quality facility provision we have seen in schools across the UAE. The stand-out auditorium is close to completion and will provide the icing on the cake for this extraordinarily well thought out and run, genuinely inclusive British school. Facilities, on completed all-through launch, include three temperature controlled swimming pools; Science and ICT labs by phase; Specialist Art, Science, Music and Technology suites; dedicated Primary Library; dedicated Secondary Library; three Multipurpose sports halls; a full-size football pitch; multiple (outdoor) sports courts; dedicated Primary cafeteria; dedicated Secondary cafeteria; (shaded) outdoor play areas by phase; landmark 500-seat theatre; and parent Café. Impressively, the school launches with a serious commitment to technology with every class having access to an iPad bank ensuring 1:1 or group activities as appropriate. 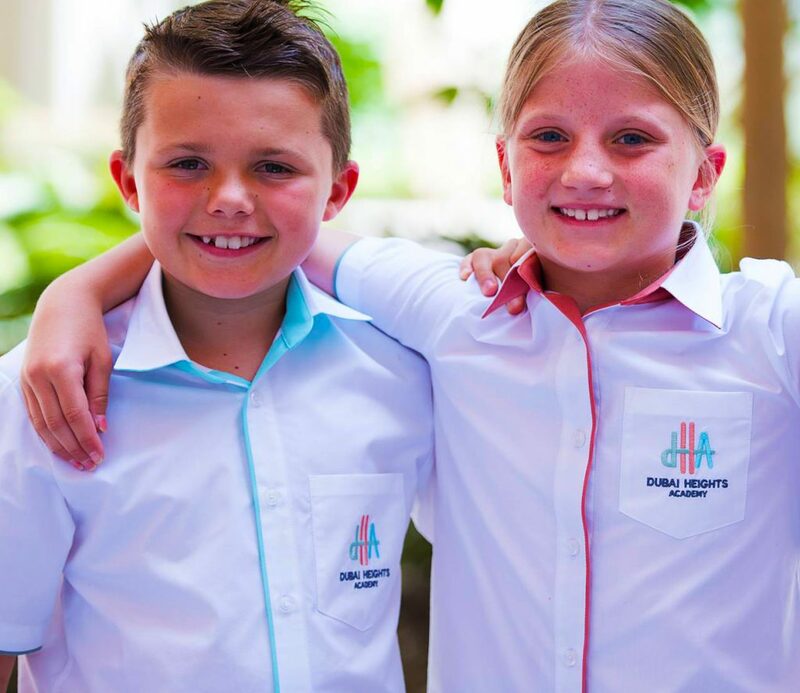 Dubai Heights Academy has been established ground up to recognise the different needs of children with Foundation Stage, Primary and Secondary school children educated separately within what works, in practice, as their own dedicated schools. Many parents choose to send their children to dedicated KG and Primary schools, often motivated by a belief that childhood should be protected. Dubai Heights Academy was established ground up to meet the needs of those parents who have historically sought out separate Primaries. Using its economies of scale, It does this, however, with a premium level of infrastructure across Sports, the Arts and broader ICT and technology Labs that smaller dedicated primary schools generally cannot match. The Kindergarden building comprises a ground floor; the Primary School building three floors and the Secondary School building is set across four floors. The school’s owners, Seven Tides, have a reputation for extraordinary architecture and innovation in design and the quality of the school’s build and facility provision is very high. The specification of three swimming pools, for example, each meeting the needs of different abilities and phases, reflects the investment and attention to detail. 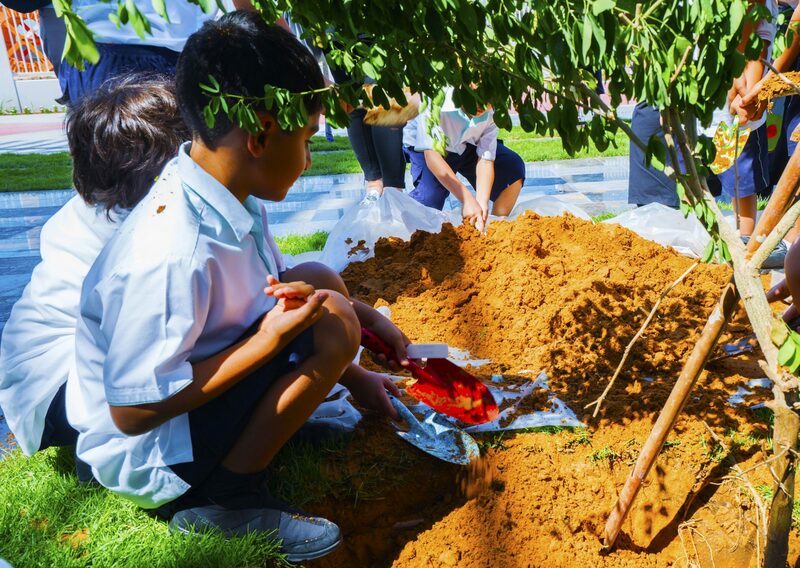 Exterior areas have been designed to meet the needs of different aspects of the curriculum, including a focus on interactive play and ecology. Some of the areas near Primary reception are dedicated to 4 Therapy rooms with provision for Occupational and Speech therapy to be provided by external staff as required in the initial stages. The aim however is to not divide children by their individual gifts but to unite them. There are a number of rooms which lead to individually designed internal courtyard spaces. One of these, for example, provides a home designed to inspire play and therapy for components of SEND – but also one that can be accessed by all children according to their adventure. There are very strong links with “Sensation Station” and the area includes a multi-sensory gym which will have magnetic elements to create a climbing area as well as hammocks. Resources can be created in various configurations with a means of hooks – and children can use magnetic letters to create words by scrambling over obstacles, or having climbed to retrieve letters from different levels in the room. This consolidates dexterity and strength in combination with academic activities such as reading and Mathematics. Again, not specific to SEN, there are 2 additional rooms for LEGO and a ‘Snoezle’ room – light therapy using five optics to stimulate or relax as required. A fabulous example of the care at play in the design is that the LEGO adventure room will allow for projects to be retained for children to return to rather than being ‘cleared away.’ The aim is that children can develop their construction projects and creations over a period of time not bound by clocks and logistics. Too often in LEGO areas children’s creations are broken up to return to their storage box – constrained and marked as transient and unimportant, simply because of the logistical constraints of the school. The LEGO areas too are likely to incorporate LEGO Robotics. The thoughtfulness here is really impressive. Planned ECA provision is outstanding, covering the full spectrum of activities across Sport (including Football, Netball, Tennis, Swimming, Golf and Rugby), the Performing Arts, Art, languages and Music. Surprisingly, Dubai Heights Academy fee levels, whilst premium, operate at the very lowest end of the spectrum. Given the quality and breadth of facilities, recruitment of faculty and inclusive ethos, Dubai Heights Academy, in our view, offers a very good value proposition for parents. 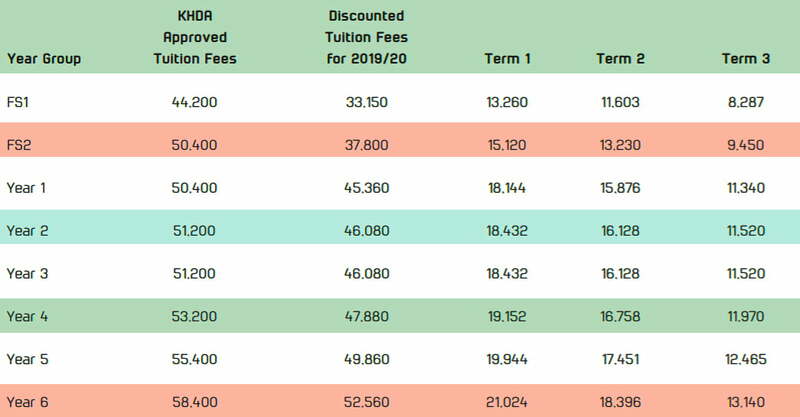 As of November 2018, Founding Family discounted fees for the academic year 2019-20 can be found below. The 25% discount is carried across the first two years of each child’s education. Years 1 – 6 enjoy a 10% discount off fees. Fee levels here are telling of the broader ambitions of the owners to provide a school that is inclusive and affordable for the widest range of families. We hope that in the coming years a dedicated supportive scholarship programme will be developed, something we believe should be provided by all schools to widen educational opportunity to children whose families would not otherwise be able to afford a place – but these, to be fair, are early days. 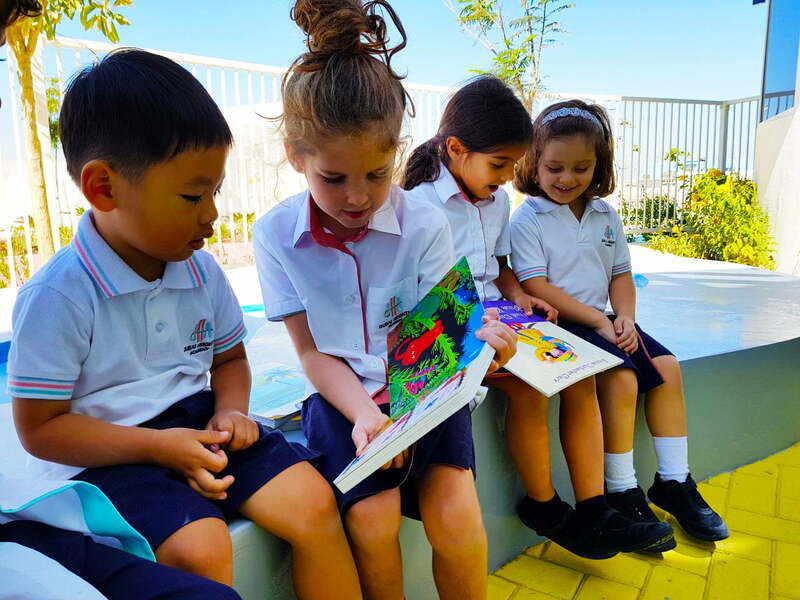 Academically, as above, Dubai Heights Academy offers a pure English National Curriculum, British education from Early Years Foundation Stage to IGCSE. It is probably too early to expect publication of the eventual planned breadth of IGCSE provision, but we do know that the school is very focused on ensuring children are equipped with two languages, French and Arabic to compliment the core teaching language of English. Arabic is introduced from FS1. “An outstanding educational experience is the greatest gift that we can give our children. From the initial recruitment information I received during my application to be Founding Principal of Dubai Heights Academy, I knew that this school would be very special – and make a difference. For everybody – the inspiration to be the best version of themselves. These ambitions could not be more perfectly in alignment with my own personal and professional ideals of what today’s education system should be providing all of our children. Andrew Prosser, Founding Principal. Dubai Heights Academy. As a 7 Tides development, we visit with high expectations for Dubai Heights Academy. This is 7 Tides first school and the stakes are high. The Emirati owners have a reputation for the extraordinary – Anatara and the Palm of course have become global landmarks – statements to the world and the Emirati people that nothing is impossible if you have self-belief and courage. A school of course presents its own very different challenges – the best schools have to achieve a balance of form and function: they have to create a learning environment that delivers to all children and their diversity of gifts. The part, however, that you cannot learn in books is that the best schools have to provide the inspiration and flair to inspire children and spark their imaginations as they develop through childhood to young men and women. In all this too, the best schools need to provide security and, in a deeper way, a sense of home. 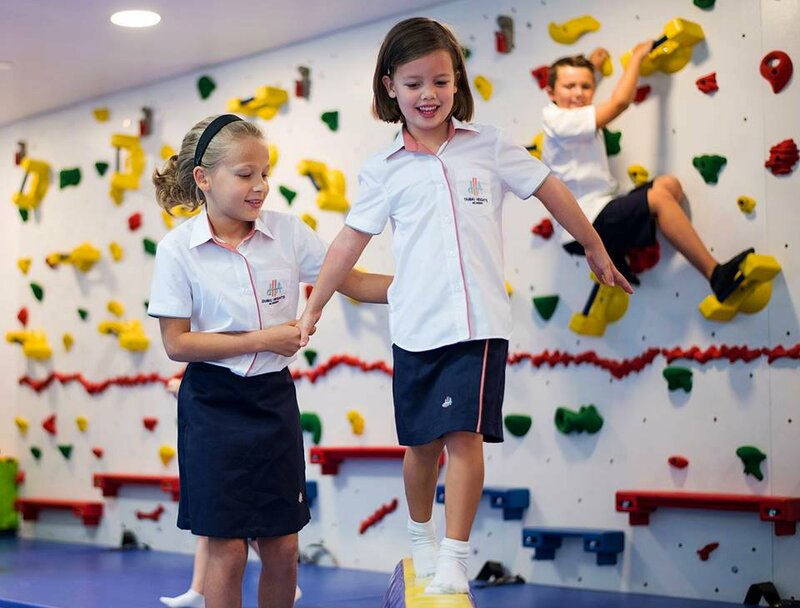 Does Dubai Heights Academy deliver? What we have learned through our three visits to the school to date (2016, 2017, 2018) is that the driver for the school’s owners is a commitment to create a perfect school for children. No compromises. Certainly the finish of the school is superb. The FS and Primary are deliberately separated, with unique and specific facilities for each. As above, the owners want to recognise the differences between children even at this younger age when many schools combine them. 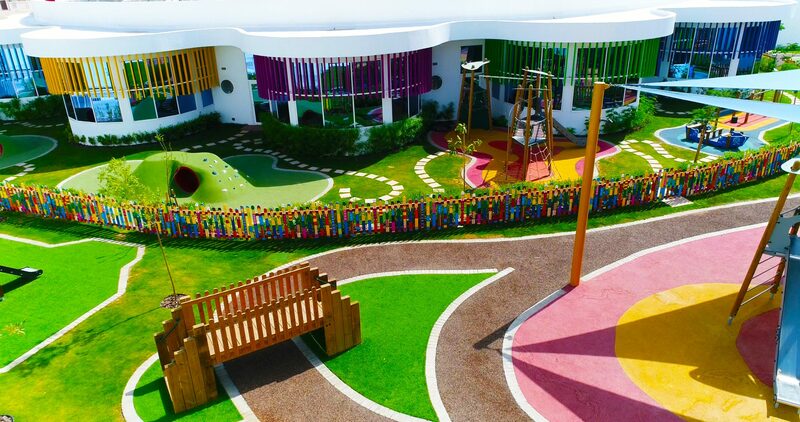 Both phases have their own clinic, outside areas, dedicated sports facilities, swimming pools —- the aim is to create environments for children at every phase that match their development with their own character and individual capacity to inspire. 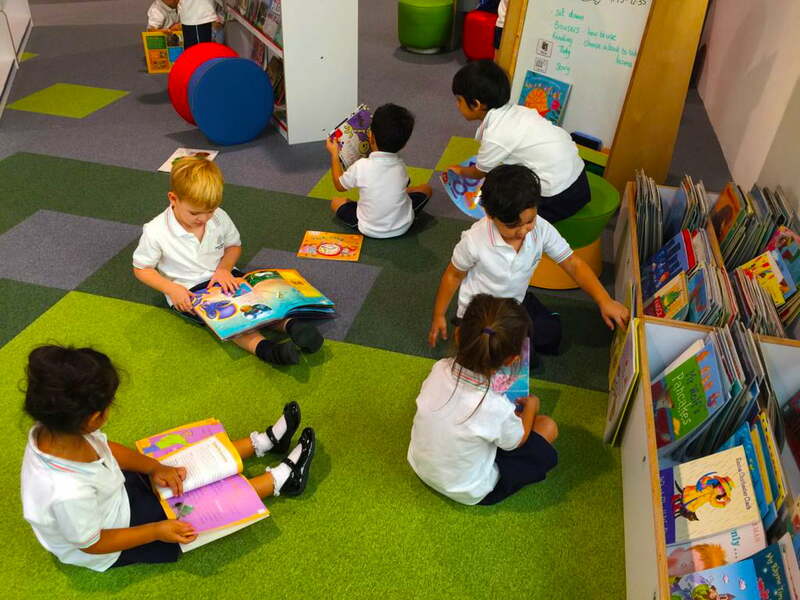 The only shared facilities within Dubai Heights Academy is the competition football pitch and landmark theatre space – more on this below, with each year group having its own cluster of classrooms and central breakout area. The internal breakout areas have natural light from 2 light towers – one on either side of the core space which extend through the upper floors to allow sunlight to flood into the lower communal areas. Capacity for the FS Primary phase is just 700 children. 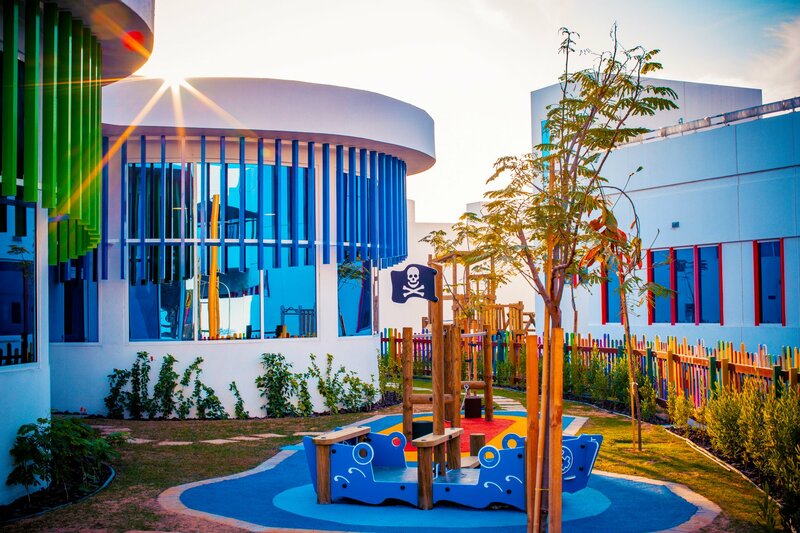 Trees throughout the central play areas highlight the difference between Dubai Heights Academy and many other new schools – the outside areas are seen as integral to each child’s education and not treated as an afterthought to be addressed years into the future. Thoughtfulness and investment has been clearly evident throughout our visits. 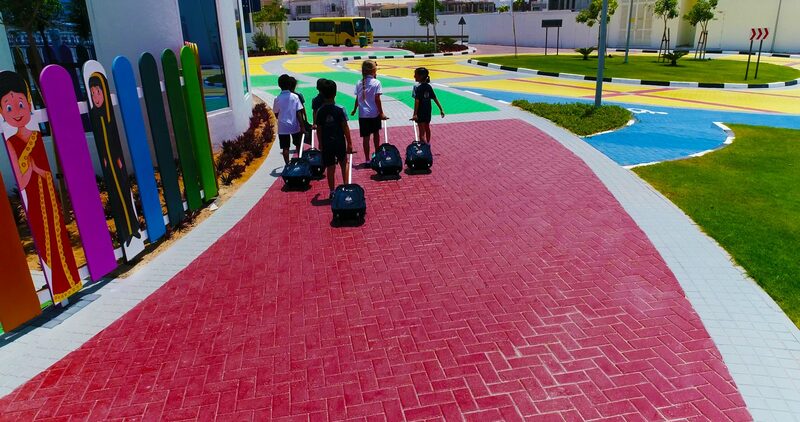 Foundation Stage children at Dubai Heights Academy have their own entrance and, as above are largely independent from the Primary school. The central courtyard incorporates a living tree to provide shade with facilities and features flowing from a dedicated reading area to a water play area with troughs around the crescent shaped room. Grid work on the walls is designed for a variety of holders and water moving equipment to be arranged by the children and fire their imagination and play. A variety of pumps – hand operated, automatic and wind-up, move the water as do cans, syringes, cogs and all manner of other vessels. Other stand-outs for us on our tour are the dedicated Sports Hall for FS and its indoor pool area. As in the rest of the school, storage rooms have been built adjacent to classrooms, sports halls and staff areas so that equipment can be carefully housed. The training pool has been stepped so that students can be in the water rather than on the side when awaiting instructions – and less confident swimmers can be in shallower areas created by the steps. Wifi is provided across the entire site, including the sports fields, pool and halls. The FS classrooms are flooded with light from enormous curved windows on the exterior, and the interior walls connect to an eye shape with the shaded courtyard in the centre. They have their own sports hall, and, another feature we really liked, teachers too have a dedicated light and airy staff room designed to equally inspire. The Primary areas are predominantly on the ground floor, with areas for Years 1, 2 and 3 in a line. Year 4 finds its home in a section at the end of a corridor forming the upright of the letter T.
Each Year group has the cluster of 5 classrooms around a breakout area with natural light tunnels. Year 5 and 6 areas are on the floor above, and sit directly over Year 2 and 3 Areas, with an open terrace above Yr 1. The ambition of Dubai Heights Academy is to see the development of this whole area for Hydroponics and Aquaponics – to create a magical space with greenhouses and fish tanks which co-exist with water recirculating from each to create a sustainable eco system for the fish and plant life. Ultimately this will involve the children in adapting computer programs to time the watering of the plants, automated feeding of the fish. The plans reminded us of the sorts of interactive play you find at the Science Museum in London. The Primary area has its own dedicated Art Room, Music Room, Library, Canteen, IT Suite, Science Labs and Library. An outdoor area leads to a shaded amphitheater for reading . A dedicated baby changing room has been created in addition to the numerous student, staff and parent toilet facilities. Storage areas are abundant and well planned. The Canteen is open to FS and Primary and the provider caters for children with allergies as a prerequisite rather than an afterthought. This is one of many examples of attention to detail and passion to get things right. Children can bring in packed lunch but this will be taken in the canteen along with the children who prefer to buy a hot meal. Capacity in the canteen is such that 2-3 Year groups can be accommodated at any one time – again a really good example of thoughtfulness and attention to detail. The Arabic and Islamic classrooms are housed in this section too and children will be introduced to Arabic at FS1 to give them every chance to become bi-lingual and develop a love of languages. 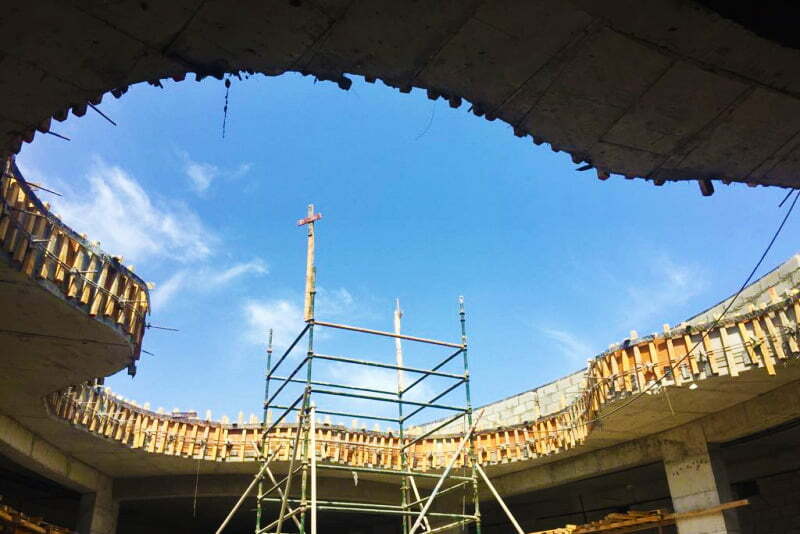 As of 2018 development of the Dubai Heights Academy Secondary School continues apace. As above, the ambition is again for the school to have its own facilities and identity. The Sixth Form will also be clearly demarcated and older children will have their own Common Room. The Secondary school will home 2 Blackbox drama rooms and these will have the option to interconnect to create one large space if required. The Secondary canteen is 50m in length and overlooks the football field and skyline. 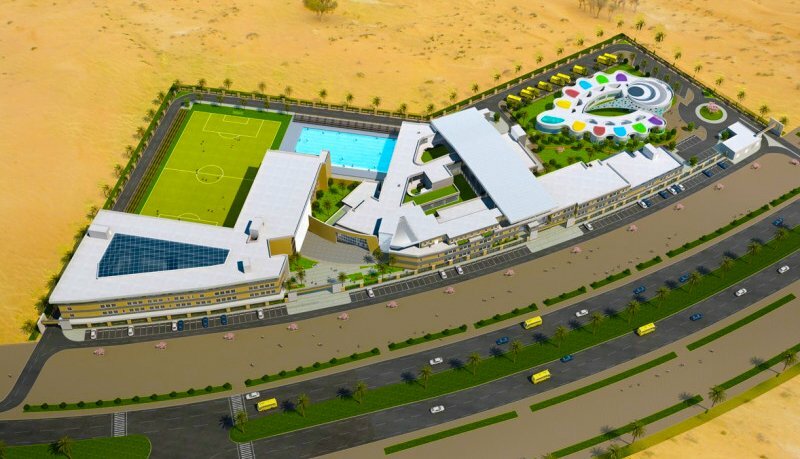 It is set to be one of the highlights of Dubai Heights facilities taken as a whole across the school. The Dubai Heights Academy Theatre is almost complete and investment here gives weight to the school’s insistence that the broader Arts are are as fundamental to the highest quality whole child focused British education as academics. The two buildings are bridged to provide the main inspirational pathway to the Theatre area on the 1st floor. The theatre has its own dedicated ’Ticket Office’ so that children are empowered to “look after this themselves and sell their own tickets to their own productions.” The lobby area outside the Theatre is large and impressive – the inspiration seems to again nod to the sense you get in a London Theatre of those moments outside the theatre where you meet ready to enter for the performance. The area houses a kitchen, 2 dressing rooms, a Green room and bathrooms on the lead up to Impressive stairs which take you into the Theatre. There is also a lift and ramp access – inclusion is built into every part of the design so that no child will ever be left behind. The capacity of the theatre is 500 with fixed layered seating. A landmark LED screen at the back of the stage provide a three dimensional-ised background for performances without the need for the staple projector even amongst other top tier schools. This is a good example of the sheer ambition and thoughtfulness at play here. The result? It’s one of the best theatre space we have seen in any school in the UAE. Bottom Line? Dubai Heights Academy – The SchoolsCompared.com verdict 2018? It is always something of a leap of faith writing about new schools. We know that it is very likely that any new school will have teething problems. It comes with the territory. But the other side of this, is the really opportunity presented by new schools to push at the boundaries of the best that current schools deliver. Owners that care and who have invested very significantly in the school. Quality of provision is outstanding. Phased, gentle opening plan designed to put children first and get things right. Care for teachers. As of October 2018 teacher turnover, at 0%, is the lowest in Dubai (this set against an average in excess of 26%). We left our 2018 visit above all with a belief that Dubai Heights is a school has a sense of educational purpose and ambition driven by children’s needs and potential. The attention to detail shines through every corner. The drive and care of the Founding Head, Andrew Prosser, and the teams of architects, builders and consultants really builds confidence. There is a sense that Dubai Heights Academy is not at all about bricks and mortar – but a shared adventure to deliver a beautiful school able to inspire the generations of children to come. Dotted around each corner example of Arabic design flourishes from play wells to roof lights and glass curved windows to clustered skyline Palms – all linked in conjoining inspiration, the environment, learning and, yes, a quite palpable sense of joy. All this in a British school with its heart very much in the right place. It’s early – the Secondary School has yet to open. But there is so much potential here. On our visits we always look to see how children respond to us and their teachers. Do they smile? Are they inspired? Do they have a sense of purpose? We also look to how children respond to the Head? Does the Head know children by name? Do children actively seek to engage with the Head with smiles and questions. In both these areas, probably the most telling of all, the answer is in the affirmative. The building blocks are in play. The children will ultimately be the ones to decide where they fall. And that’s exactly as it should be.